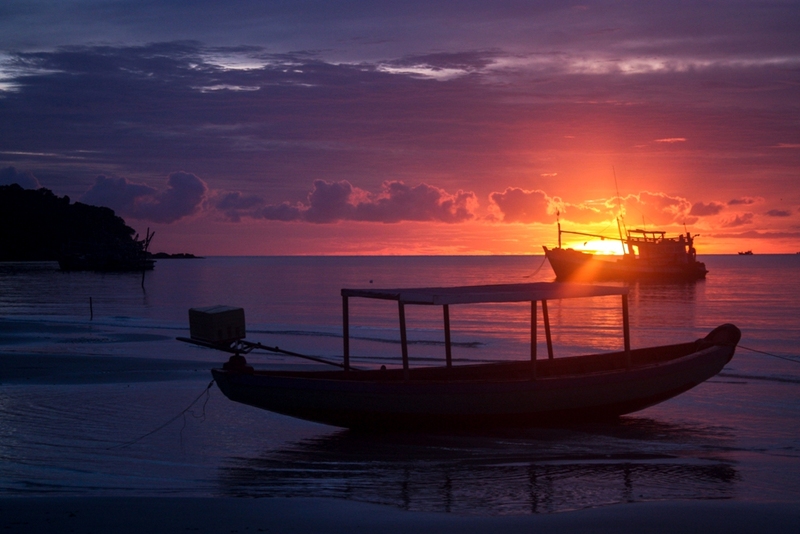 Most visitors to Phu Quoc (pronounced: Foo Kwok) generally stay in the town of Duong Dong, towards the middle of the 31 x 16 mile island, where the majority of hotels and restaurants are situated. Some may take a snorkeling tour to the gorgeous beach of Bai Sao and the pearl farms and fish sauce factories to the south. There’s not a whole lot to the north of the island, dominated by the national forest towards the middle and sleepy fishing villages around the coast. After visiting gorgeous Bai Sao (Star Beach) and doing a tour around the island’s south side, I decided to head up to the north shore for a few days, intrigued by a boutique hotel that promised seclusion – deserted beaches, more hammocks than people, miles away from the trappings of civilization. 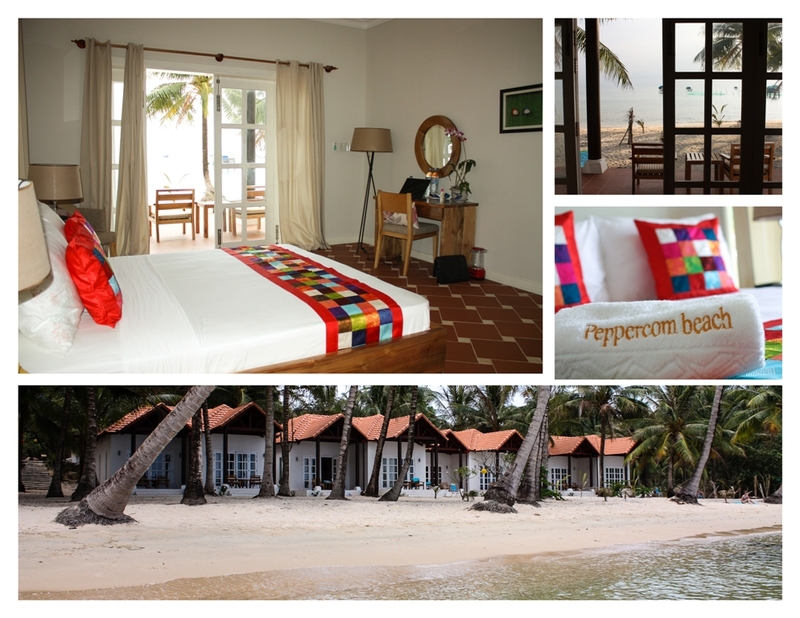 Open less than a year, Peppercorn Beach Resort had already shot up to #2 on TripAdvisor for Phu Quoc hotels and I was determined to find out what the fuss was all about. 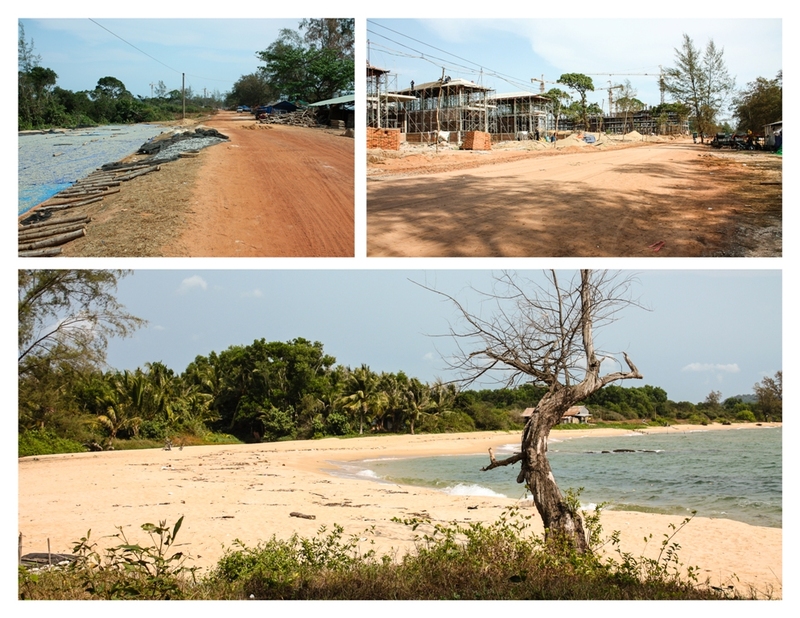 There are three roads to get to Ganh Dau, the northwesternmost point of the island where Peppercorn is located, and also point closest to the Cambodian mainland just 8 miles away. One dirt road hugs the coast, just meters from the beach. A two-lane cement road paralleling the coastline was finished just months ago, cutting the travel time practically in half, to about 30 minutes. Very strangely, it’s not well marked as you make the turnoff from town and bizarrely starts with a runway from Phu Quoc’s old airport. 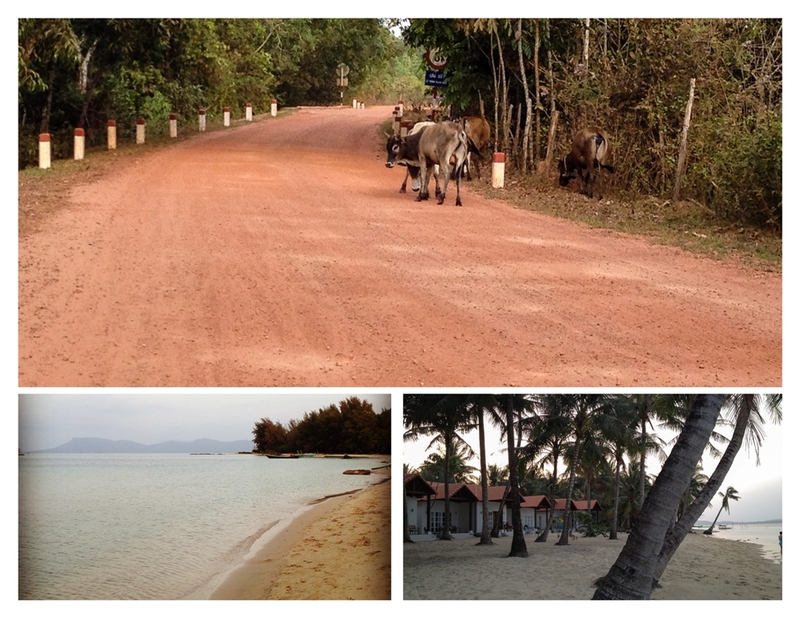 A third dirt road cuts up the middle of the island, through Phu Quoc’s national forest. Dusty but scenic, with no road signs to speak of, I’m glad I got a chance to see the island’s interior, but thankful that it was during daylight hours as pot holes and sand traps needed dodging. The stress of the drive melted away once I pulled up to Peppercorn, a group of four bungalows (eight rooms) set right off the beach. Looking out over the water, past the netted enclosures where locals raise sea mollusks, you can see the nearby Cambodian islands, but really, the reason to come all the way out to this part of the island is to get away from it all. Vietnamese-Australian Linh and her Australian husband Robert actually built a vacation home here in 2006, over time buying up the surrounding plots. Now based in Singapore, the couple have turned over day-to-day management of the new resort to family members, but have set everything up to Western standards. Linh happened to be there during my stay and she shared her philosophy of operating the resort while preserving the beauty of land and people that brought them here in the first place. The resort is eco-friendly, utilizing rainwater collection, solar panels and energy efficient appliances. Linh’s family is also involved in the community. While I was there, one of the bungalows was provided to an British man rent-free while he was setting up an English education project for local youths. For instance, there’s no swimming pool or spa. But when you throw open the French doors in the morning, walk down two steps and already feel sand through your toes, those things fade into insignificance. Wifi was surprisingly fast, fast enough to stream live sports, but… why? 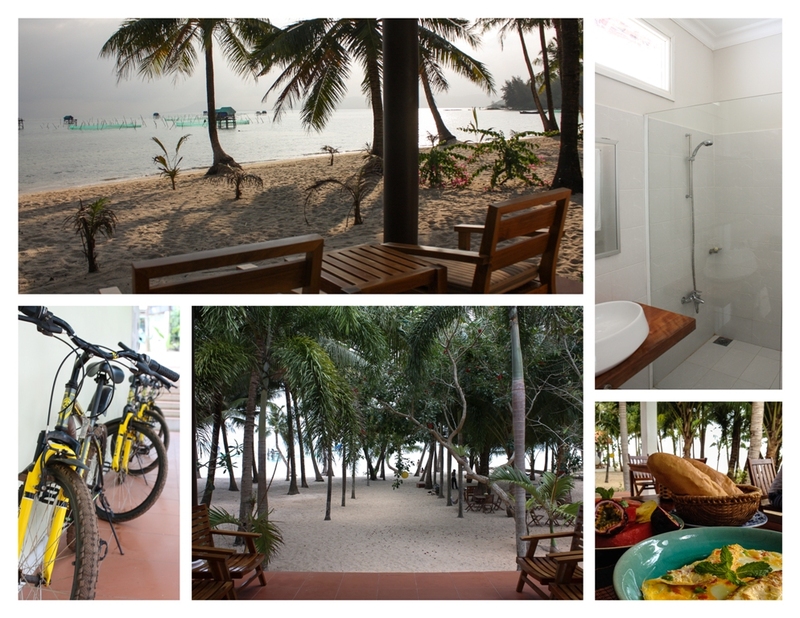 Days are meant to be spent swimming in the ocean, reading a book on your porch or in the comfortable common room, or taking one of the resort’s bicycles to explore the surrounding village. 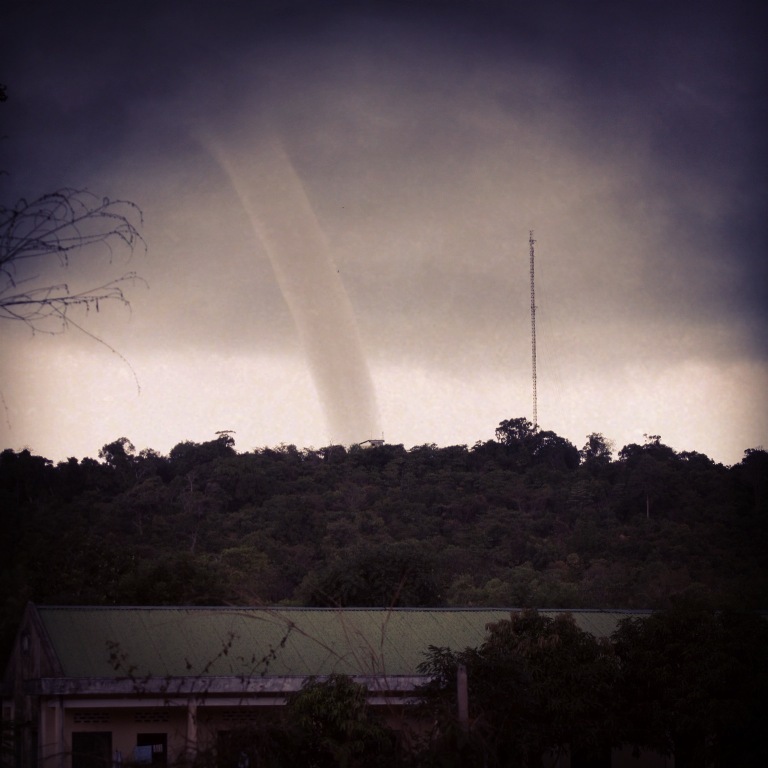 I tore myself away from the beach one morning to take a drive through the sleepy fishing village of Ganh Dau, where an ominous-looking water spout was the most excitement the town had seen in a while. 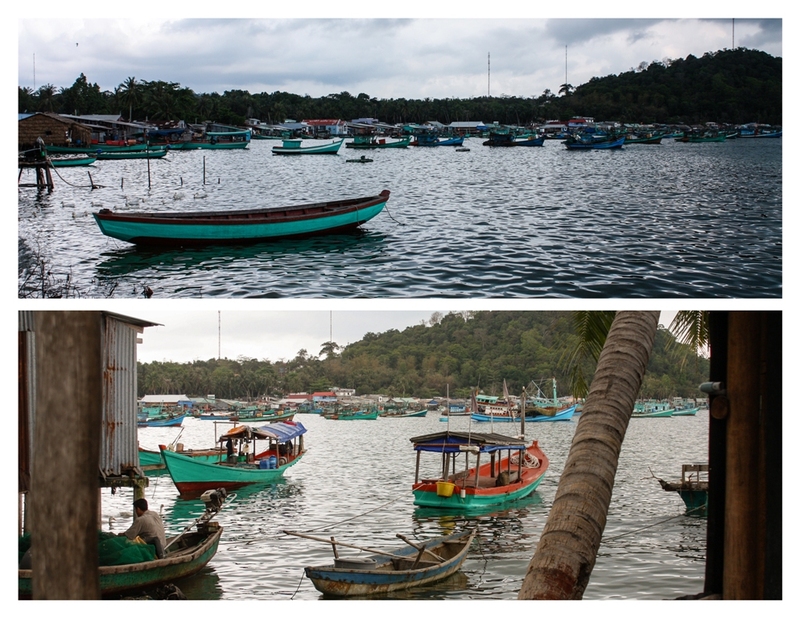 The weather soon cleared and I made my way past the picturesque fishing village. 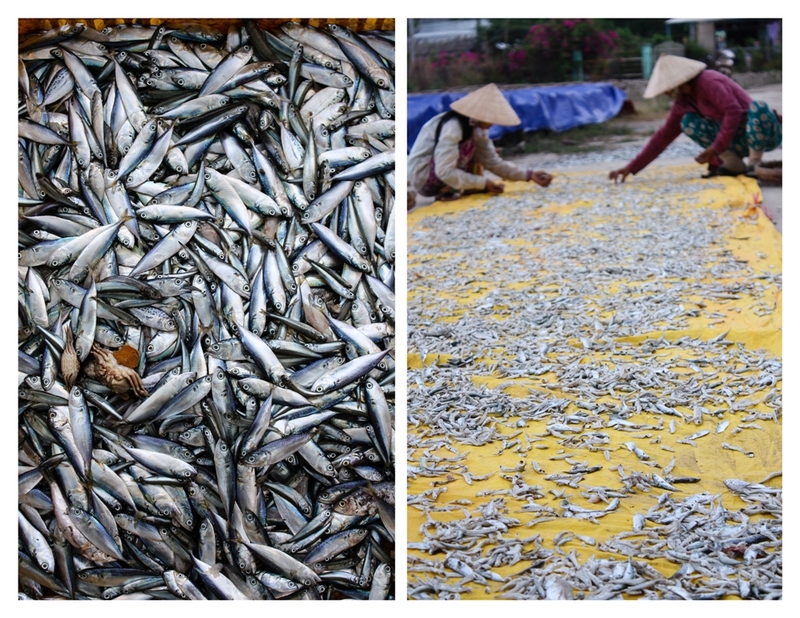 Along the dusty roads lie little cottage industries centered around the products of the sea, like these tiny fish drying in the sun. 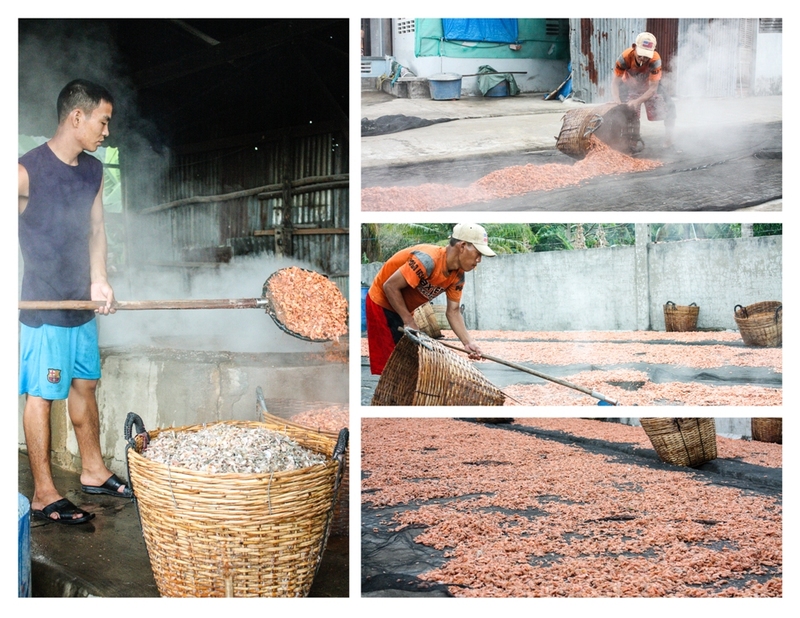 …before neighborhood women pick out shells and bits before the shrimp are packaged and sold all over Vietnam. About 10 minutes away, where the new paved road starts, lies Sunset Beach and a lovely restaurant by the sea serving up two of my all-time favorites, plucked live from tanks: tamarind crab and sweet and sour soup with shrimp. 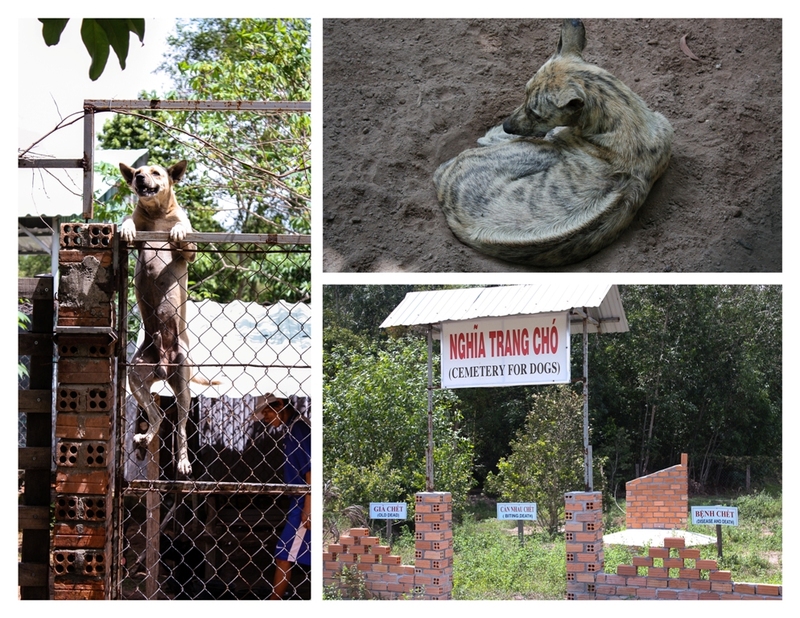 The northern part of the island also has a few dog training and breeding facilities (entrance: USD2). The Phu Quoc Ridgeback, characterized by a telltale ridge of hair that runs in the opposite direction along its spine, is just one of three ridgeback species (the other two are from South Africa and Thailand), and are found everywhere on the island. 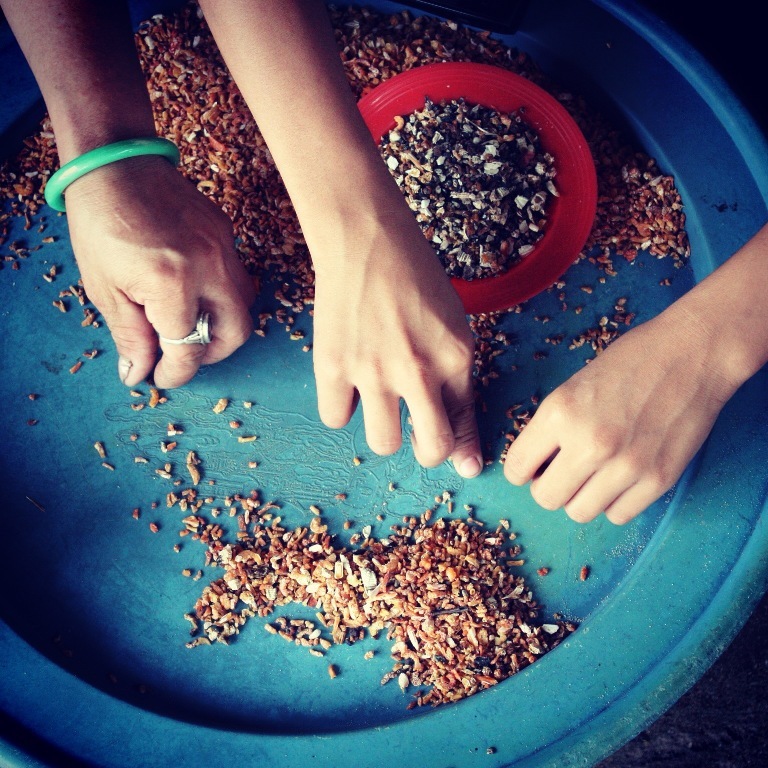 In addition to fish sauce, the island is also known for its pepper. 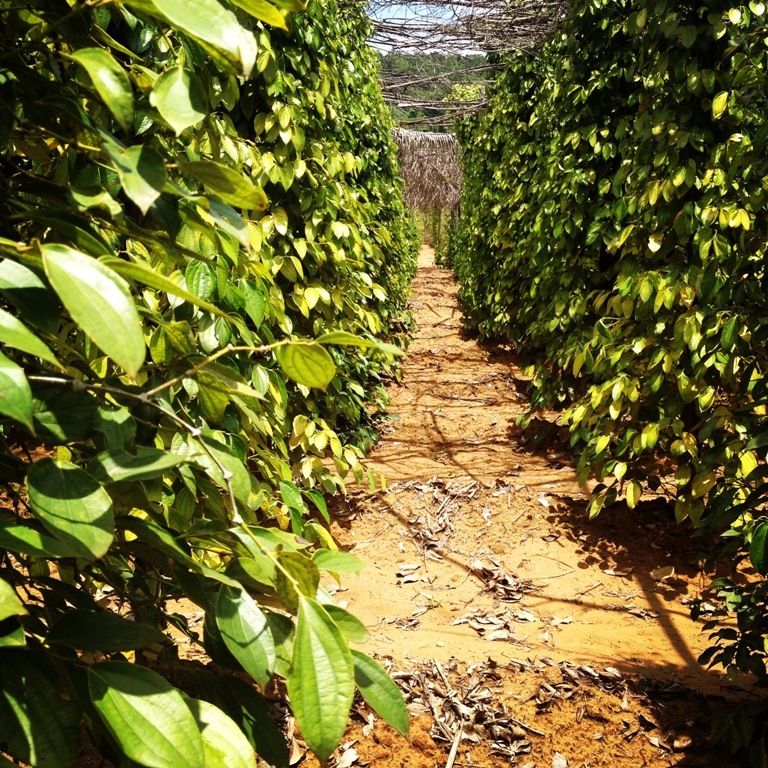 Plantations line the roads, with each bush yielding 3-4 kgs of pepper in a bumper season. How long will the charms of this idyllic island continue to beckon? Phu Quoc was just connected to the national electricity grid earlier this year, a huge step towards modernizing the island. It also brought electricity prices down from VND25,000 per kwh down to just VND1,500, according to Linh, leading to stable internet, air-conditioning units that can run through the night and making life in general easier for the population and for tourists. Being so remote, Peppercorn had to pay for 2km of wiring all the way to their property, allowing some locals to have access they couldn’t afford previously. Visitors will notice road construction everywhere, both to the island’s south and north coasts. 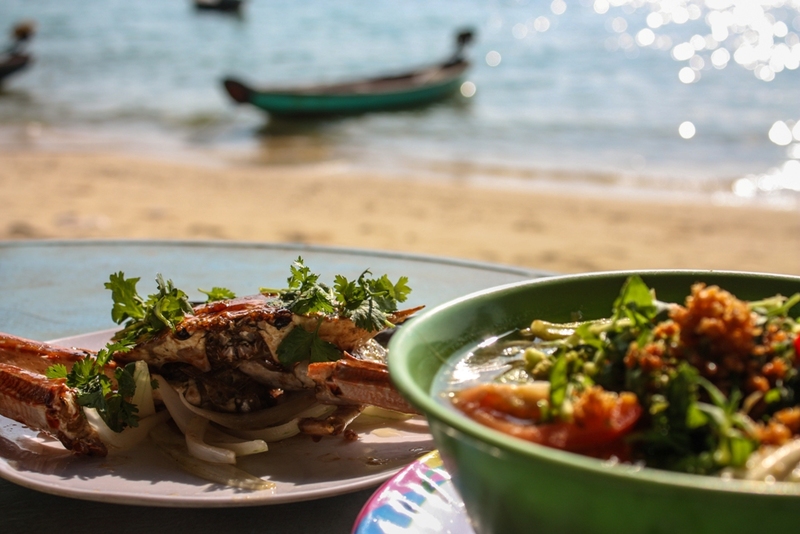 A recent tourism initiative allows visitors to fly directly to Phu Quoc without a Vietnamese visa for 30 days, an effort to bring the world to this quiet paradise. Just south of Ganh Dau, there’s a long stretch of undeveloped beach called Bai Dai (Long Beach), the future site of a massive 500-room resort, already under construction by the Vinpearl Group (who also developed the amusement park / resort of Vinpearl Island off Nha Trang’s coast). Families have been bought out, trees cleared, materials brought in. The heavy footfalls of “progress” are inevitable. 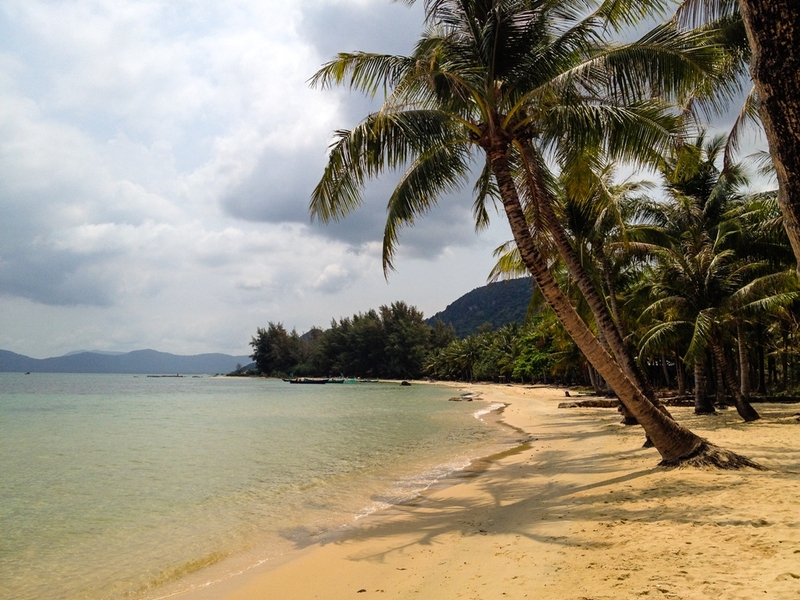 So, if you’re fortunate enough to be in this part of the world, make time for Phu Quoc. 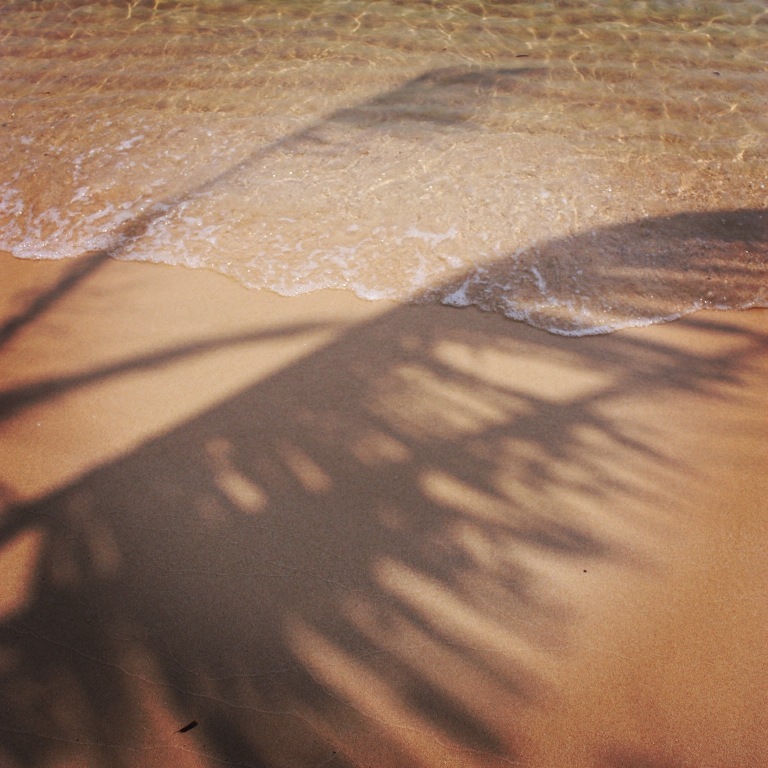 Make time for its quiet, sandy beaches. Make time for its glorious sunrises and sunsets. Make time while there’s still time. A version of this post originally appeared on Fly, Icarus, Fly.